Bernice James, 94, of Maumelle, AR, died Monday, September 10, 2018, at Hospice Care Center in Little Rock. The daughter of Ollie and Mary (Atkinson) Thomas. She was born January 12, 1924, in Waveland, AR. She spent most of her life as a homemaker, but also worked as a caregiver at the Mitchell Nursing Home in Danville. While her husband served in World War II, she worked as a "Rosie the Riveter" in the aircraft industry at Oklahoma City. 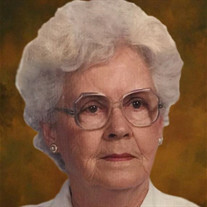 She was a member of the Maumelle First Baptist Church where she served as the treasurer for her Sunday School class. Her greatest passion in life was her family, and to them, she was a very special mother, "Grandmother," and "Great Gran." She also enjoyed reading and quilting. Bernice was preceded in death by her husband Alvis "Bud" James; her parents; and a son, Tommy James. She is survived by two daughters, Elizabeth Ann Holland of Roland, AR; and June Cathy Brothers of Little Rock; three grandsons, James A. Holland of Roland; Lloyd L. Brothers III, of Little Rock; and, James Brothers of Little Rock; a granddaughter, Sara Ann Holland, of Roland; four great grandsons, Logan Brothers of Van Buren; Parker B. Brothers of Little Rock; Elliott J. Brothers of Cabot; and Frank A. Holland of Fulton, MO; two great granddaughters, Maya A. Holland-Moore; and Gemma R. Holland-Moore, both of Roland; and, a host of other relatives. Cremation arrangements are under the direction of Humphrey Funeral Service. A private family memorial will be planned at a later date. Memorials may be made to: Hospice Home Care, 2200 South Bowman Road, Little Rock, AR, 72211. Internet obituary and on-line guest book are available at www.humphreyfuneral.com.